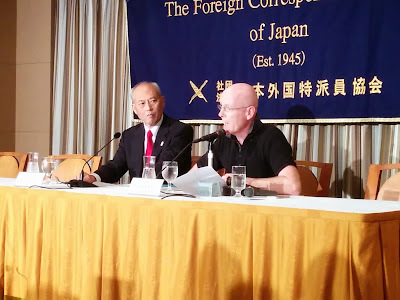 15:30 Introductory remarks, laughing, explaining what he has been doing in regards the Chinese poaching fo jewelry coral, and then it hits you - Holy crap Governor Masuzoe is holding his press conference in English WITHOUT A TRANSLATOR PRESENT. It is just the governor and David McNeill up there on the rostrum. 15:40 Reading from prepared remarks - and surprisingly, or not so, his English pronunciation is better when extemporizing or riffing on the prepared remarks than when he is reading. OK, enough of the incredible bravery of the governor of Tokyo giving a press conference in what is his third language. 15:42 Brings up the possibility of regulations banning smoking in restaurants. 15:44 Talks about his visits to London and Moscow in city-to-city diplomacy. Great times with London's Boris. 15:45 Now the biggie - turning Tokyo into a more important financial center. 15:48 Supplementary Tokyo assembly budget will subsidize Hydrogen fuel cell vehicles to the tune of 1 million yen per vehicle. Tokyo will subsidize the building of 80 fueling stations. 15:52 Wild rhetorical flourishes to wind up the prepared remarks, calling the Olympics the last best way of reviving Japan. 15:56 Fireworks as a Japanese blogger (?) accuses the Governor of shady political financial declarations. Re of Masuzoe's eyes stand out as he cuts the questioner off, saying that all the questions on this subject have been answered at his Japanese press conference. Young man continues to try but Mazuzoe cuts him down. McNeill has to ask the young man to sit down. 16:00 Asked about 24 hour ATMs, asks questioner to consider the possibility of cashless, Internet banking. (In truth, probably in 6 year's time, we may be using cash a longtime). Mazuzoe taks of a political leader is prioritization. If one does not create packages of policies, rather than an item here, an item there. 16:12 Casinos? Masuzoe does not say he is against them but he wants a deepened, national discussion. 16:14 The cost of the Olympics, materials and labor costs have indeed gone up. As regards Fukushima, he receives no special information from the government. However, Tokyo will go from 6% renewables to 20% renewables in X years. Damn, how many was it. 16:25 Governor enthusiastically answers my question on Tokyo's responsibilities to share its good fortune and enrich the other prefectures as well. He argues that the relationship between Tokyo and the other prefectures must not be zero sum but instead win-win. His caveat is that Tokyo cannot be the only engine: Osaka, Fukuoka, Osaka must pull together with Tokyo (interesting implications for the shu-sized administrative unit plan, which would tend to divide the major cities and set them to competing with one another). Masuzoe was just in Berlin a few weeks ago. I attended his joint speech given alongside the mayor of Berlin on eco-city development. I was impressed: he gave the whole speech in German, and then opened up the floor to Q&A with Japanese-German simultaneous interpreting. It seems that he wants to prioritize electric railway expansion in Tokyo in order to reduce carbon emissions.